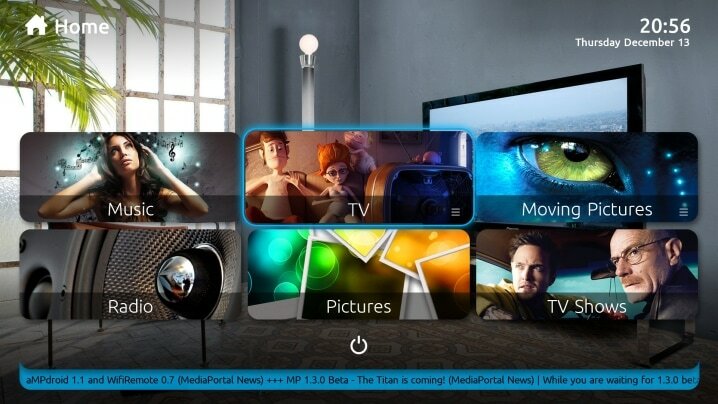 MediaPortal is a free open source media center software, ideal for turning your PC into a very advanced multimedia center, or Home Theater PC, to view all your digital media in your living room. MediaPortal offers you the most powerful TV Engine and PVR (Personal Video Recorder) available today. You can do everything a TiVo can, and more, for free! The user interface is a snap to learn and use. Standard menus, layouts and views let you choose your style of display. Most remotes are supported and you can configure the keys however you want. As open source software licensed under the GNU/GPL agreement, MediaPortal is free! That means you can contribute to it, or tweak it to your heart's content. We don't just allow it, we count on it! MediaPortal was designed to be extended. There are hundreds of amazing plugins available to do almost anything you can imagine, even stream web TV, Apple Trailers, Youtube videos or internet radio. Audiophiles will love the DSP (Digital Signal Processing) and FX options for gain and compression as well as the ability to incorporate Winamp and VST plugins, not to mention all the visualizations supported. Connect all your PCs and stream music, video, live or recorded radio and TV throughout your home. With MediaPortal you can do so much more! Everything else is just a Media Center. Welcome to the best media experience with MediaPortal! MediaPortal transforms your PC into a complete media solution. It runs on basic hardware, connects directly to your TV and displays your TV Series, Movies, Photos and Music in a much more dynamic way. All in the comfort of your living room, on your big screen LCD or Plasma TV or projector! Watch, schedule and record live TV - like a TiVo, but more, and for free! That’s only the basic features! By using the hundreds of plugins and skins available, you can do almost anything—like monitor your HTPC; view sports scores or local movie show times; stream or download web TV, Apple Trailers, YouTube videos or internet radio; even start up MediaPortal playing music from a predefined playlist. MediaPortal is quite simply a revolution in media control, it allows you to watch, listen, read and play your media as you want to, without getting in the way, or having to learn difficult navigations systems. Just view our Features pages , visit our Skins Gallery or check out all the plugins and see for yourself. MediaPortal is for free but we would be thankful if you support our team with a donation. Take Online Class? Read On.